The study asked consumers whether they would be likely to consider using ‘check-out’ technology – i.e. using an app on their phone to scan barcodes on the products they want then pay, without a trip to the till. The data reveals that 46% would be unlikely to, compared to around a third (36%) that would. Elder consumers are most against the idea, with just 20% of those aged 55+ saying they would be likely to consider it. What are the barriers to use? Around two thirds (68%) think they would worry about technical issues with the app that would impact the shopping trip. Added to this, half (51%) say that while the idea is interesting, they would not feel comfortable scanning and paying for their goods using their phone, this is particularly true for those in the eldest age group (66% of 55+). But why would people consider? 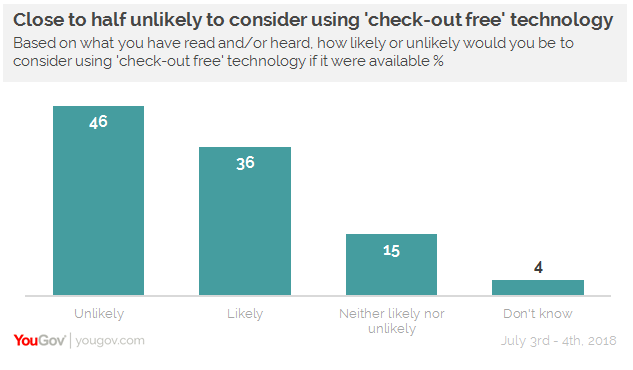 YouGov’s data indicates that over a third (37%) would see not having to interact with checkout staff as a bonus to ‘check-out free’ technology. Those that are aged 25-34 are much more likely to say this (57%), as are those that are in full time employment (45%). Added to this, approaching six in ten (58%) agree that this sort of technology would reduce queues at manual checkouts. It appears as though this technology would appeal to those making a quick trip to the shops, rather than those doing a weekly or monthly visit. Four in ten (41%) would be more likely to use this technology for &apos;on-the-go&apos; shopping trips rather than anything larger (only 28% disagree). While many consumers see the benefit of ‘check-out free’ technology, predominantly due to its time saving potential, our data shows that the a good number of shoppers feel the negatives outweigh the positives at the moment. 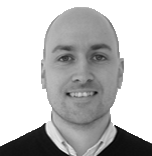 Security issues and mistrust concerning phone payments are just two of the worries that brands and tech companies will have to allay if this technology is to become a permanent fixture in our supermarkets. Building trust over a period of time using trials seems like one way to slowly introduce the system into everyday use.